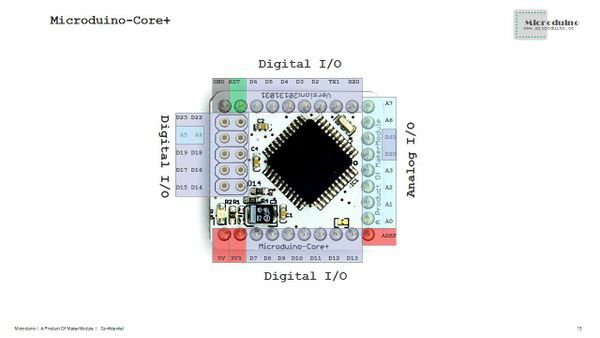 Microduino-Core+ is an 8-bit microcontroller development core board based on Atmel ATmega1284P and ATmega644PA series as the core and it is an open-source controller module compatible with Arduino UNO. 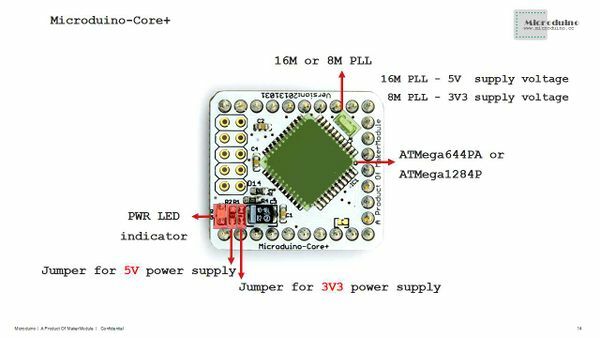 Beside Microduino-core+ has the features of Microduino-Core, the number of input and output of Flash, RAM, EEPROM of it has been greatly improved, and the pin conforms to the norms of Microduino, and the players can upgrade core to core+ smoothly, without modifying the arduino code basically. 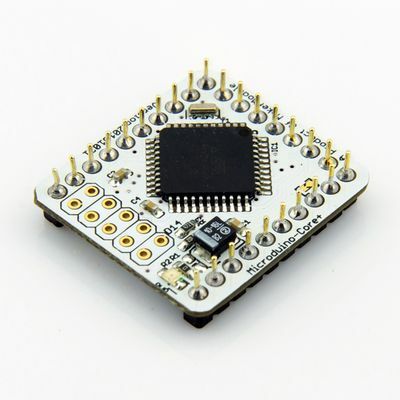 Microduino uses java and C language development environment, same to Arduino. Players can use Arduino IDE, cooperated with software such as Flash or Processing , with Microduino and other electronic components, modules and sensors to make many funny interactive works. Strong configuration. Its biggest Flash and SRAM can arrive 128KB and 16KB respectively. Small, cheap, stackable, and open. 2.54 spacing mother of interface is convenient to integrate into the hole plate. Labeled on the module of D0, D1, D2~D13 and A0~A7, and the 10 （D14~D23） more than core . Please refer to analogRead() function. Labeled on the module of respectively D7,D8,D9,D10,D12,D13,D22,D23. Please refer to analogWrite() function. Labeled on the module of Serial[D0(RX),D1(TX)] and Serial1[D2(RX),D3(TX)]. Connected with USBTTL,it will occupy D0 and D1. If the ports D0 and D1 are also occupied by other modules, this will lead to the communication with USBTTL is abnormal and the program can not be downloaded. Labeled on the module of D13(SCK),D12(MISO),D11(MOSI) and D10(SS). Labeled on the module of SDA(D20),SCL(D21). Labeled on the module of D2(interrupt0),D3(interrupt1) and D6(interrupt2). The main components used in Microduino-core+ . 1.Downloading programs to Microduino-core , players need to useMicroduino-USBTTL module. 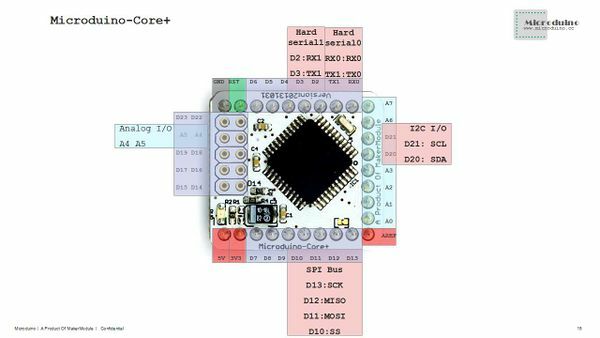 You can refer to the tutorial： Do you know how to use Arduino UNO to program bootloader to Microduino-Core？. Q:How do I judge that the voltage of the Core+ is 3.3V or 5V? A:Look at the resistor. If the R1 is welded, it is 3.3V. And if the R2 is welded, it is 5V. Q:Can I use 3.3V voltage to supply power to the Core+ of 16m clock frequency? A:It is not recommended . If the voltage is too low, it is easy to be unstable. This page was last modified on 4 August 2017, at 03:47.